San Salvador, El Salvador – Insecurity and violence are top concerns among Salvadoran voters as they head to the polls on Sunday to choose their next president, but days ahead of the election, candidates have hardly confronted the topic of gang violence head-on. “It’s an issue that all the candidates have avoided,” Carlos Rodriguez, a deputy public defender with the office of El Salvador’s Human Rights Ombudsman, told Al Jazeera. El Salvador closed 2018 with a rate of 50 murders per 100,000 inhabitants, cutting the statistic in half compared with 2015 when homicides spiked to 103 per 100,000 – a level not seen since the country’s civil war. 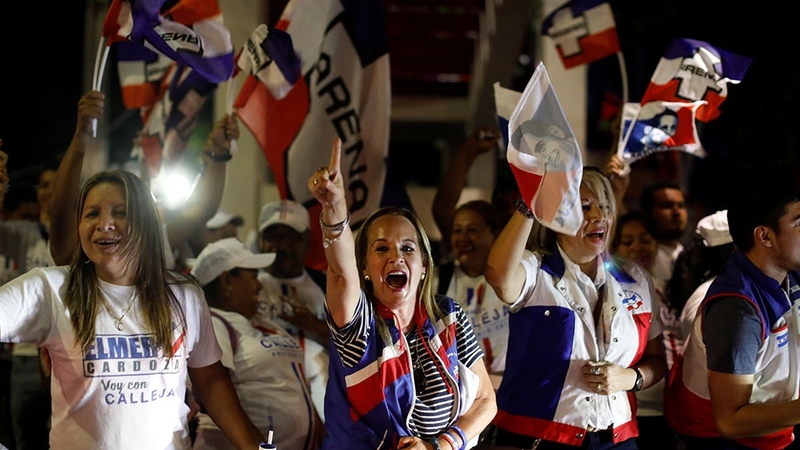 The race’s frontrunner, former San Salvador mayor and businessman Nayib Bukele, has joined forces with the conservative Grand Alliance for National Unity (GANA) after being ejected from the left-wing FMLN. For Veronica Reyna of the Passionist Social Service (SSPAS), the suggestion that Bukele, if elected, could tap GANA legislator Guillermo Gallegos as security chief is “very worrying”. Despite the United Nations highlighting a pattern “amounting to extrajudicial executions and excessive use of force” among security forces, Gallegos has proposed granting amnesty to police officers who kill in self-defence. Bukele’s rivals, supermarket mogul Carlos Calleja of the conservative National Republican Alliance (ARENA) and Hugo Martinez of the governing FMLN, refuse to dialogue with gangs. With the exception of a secretly government-facilitated gang truce in 2012 under former FMLN President Mauricio Funes, both ARENA and FMLN have championed an “iron fist” security policy, known as mano dura, that has failed for 15 years to control violent crime. Reyna believes anti-gang rhetoric may have lost currency in election campaigns after so many years of unsuccessful strategies. “Now, it’s better if they don’t even talk about it because the supposed solutions haven’t been achieved,” she told Al Jazeera. Since entering office in 2014, President Salvador Sanchez Ceren’s left-wing FMLN government has deepened heavy-handed security, including ramping up militarisation and putting incarcerated gang leaders on lockdown to cut communication with their ranks. Reyna believes effectively tackling the gang problem requires breaking systemic impunity and overly punitive measures that stigmatise marginalised communities, but she doesn’t trust any of the top candidates will “dismantle this logic”. “Every president has strengthened intervention of the armed forces in public security instead of strengthening the appropriate institutions,” Rodriguez of the Ombudsman Office said, slamming mano dura as an “absolutely” failed policy. Both ARENA and FMLN bought votes from gangs in the 2014 election for a combined price tag of $350,000. The pacts came to light in court testimony when government officials – later acquitted – faced trial for facilitating the 2012 gang truce, which temporarily slashed the homicide rate by half. “It’s clear that in the territories there are powers, and those powers determine who can go there, when they go, and what they go to do,” said David Ortiz, lawyer and public security expert with the Foundation for Studies on the Application of Law (FESPAD). “My impression is that as gangs become a political actor, they stop being a scapegoat,” she told Al Jazeera of candidates’ campaign silence on gangs. While dodging security debates, candidates have also avoided addressing migration. Nearly 3,000 Salvadorans have joined the Central American exodus since October, and nearly half – 46 percent – cited insecurity as a reason, according to the International Organization for Migration. “We’re in between the two (most powerful gangs), that’s why it’s complicated,” Garcia told Al Jazeera before departing the capital city. El Salvador has a decades-long history of migration to the US, and remittances made up 18 percent of the country’s gross domestic product (GDP) in 2017. “The commitment of our country shouldn’t be to reduce migration, but rather to help people migrate with more dignity,” said Marroquin, adding that such efforts should involve creating conditions that allow people to choose not to flee home. Will UAE face sanctions over Venezuelan gold?